Open Edition 01 — SPOLIA. 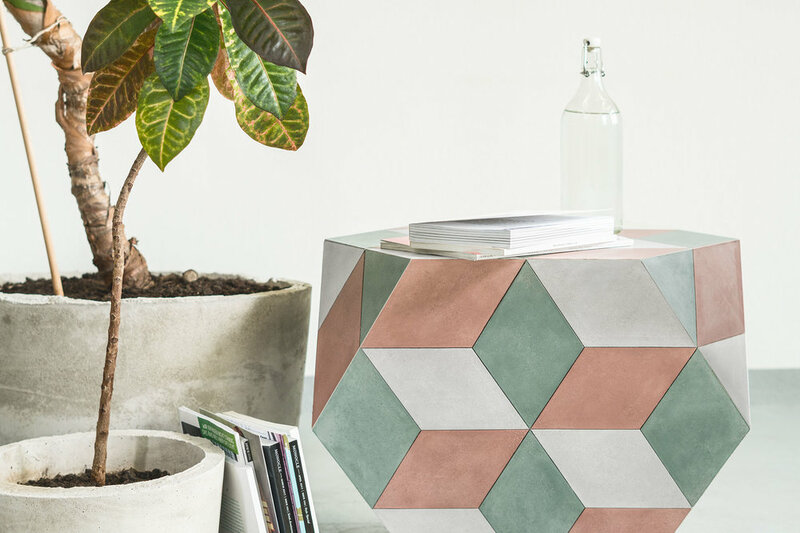 THE BOLOGNESE POP CONTINUES TO ACT AS A SIDE TABLE, A STOOL AND AS AN EYE-CATCHING STATEMENT PIECE, BUT ITS UNIQUE SHAPE IS NOW FURTHER ENHANCED BY THE COMBINATION OF THREE DIFFERENTLY COLOURED TILES. MADE FROM AN INNOVATIVE CONCRETE COMPOUND THE BOLOGNESE IS NOW LIGHTWEIGHT AND AVAILABLE IN EVERY COLOUR. THE BOLOGNESE POP IS A PLAYFUL NEW VERSION OF THE COLLECTION'S EARLIER LIMITED EDITION LINE (2015, ED. 15), OFFERING A LIGHTER AND BRIGHTER ALTERNATIVE AS A SIDE TABLE, A STOOL OR AS AN EYE-CATCHING STATEMENT PIECE. 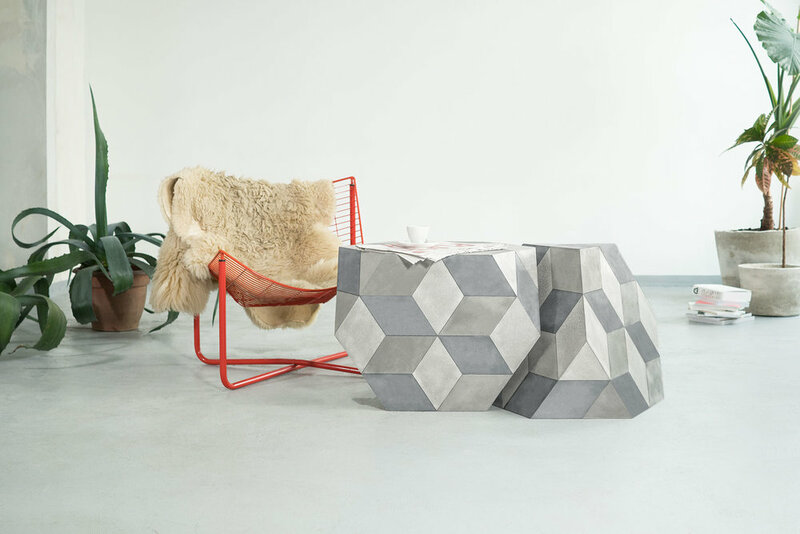 MADE FROM LIGHTWEIGHT COMPOSITE CONCRETE, THE ORIGINAL'S RHOMBIC PATTERN IS HERE ACCENTUATED BY A CLEVER USE OF COLOUR, WHICH CAN BE CUSTOMISED FOR EACH COMMISSION. THE TITLE REFERS TO THE ORIGINAL SERIES, WHICH WAS CONCEIVED FROM ANTIQUE PARQUETRY RETRIEVED FROM BOLOGNA, MADE FROM WOOD IN THREE SHADES. THE BOLOGNESE POP IS NOW AVAILABLE IN ANY COLOUR COMBINATION. ALL SPOLIA PRODUCTS ARE PRODUCED ON REQUEST AND HAND-MADE IN VIENNA, AUSTRIA. PLEASE INQUIRE ABOUT THE AVAILABILITY OF THIS COLLECTION BY CLICKING ON THE BUTTON BELOW. TINO VALENTINITSCH CURRENTLY WORKS IN NEW YORK AND VIENNA AS PRODUCT AND GRAFIC DESIGNER FOR HIS INTERNATIONAL CLIENTS. HIS EYE FOR QUALITY NOT ONLY MADE HIM A DESIGN COLLECTOR HIMSELF, BUT ADDS A TIMELESS ATTITUDE TO HIS OBJECTS.